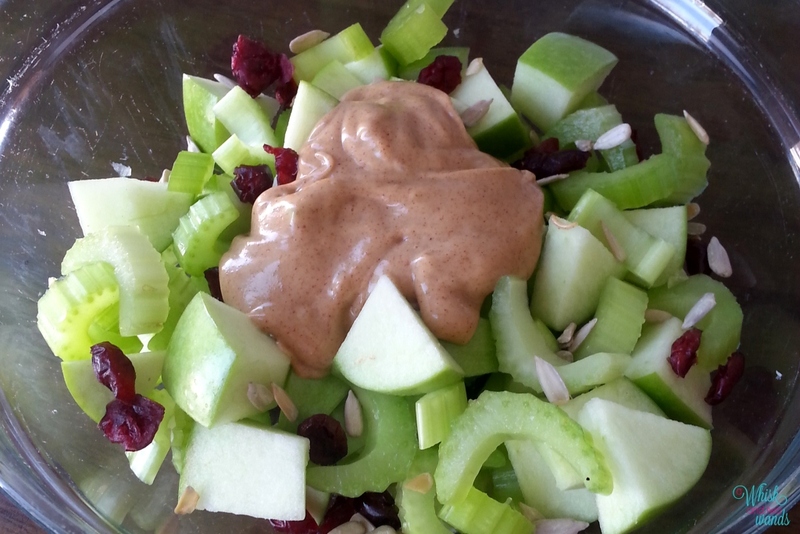 Apples and nut butter are one of my all time favorite snacks so it is no surprise this is one of my favorite salads to whip up. 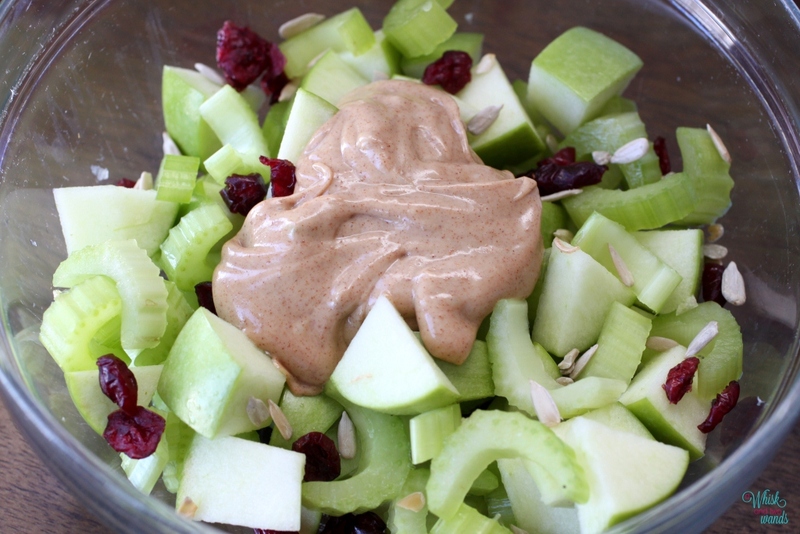 This combines that as well as another favorite childhood snack, celery and nut butter! I have posted other salads before using nut butter to make a dressing as I like nut butter, hummus, and avocado for dressings over traditional dressings. This one has a lot of crunch and flavor! Again it is one that I make depending on what I have on hand and my mood. Sometimes I add carrots, sometimes dried cranberries other time raisins, if I want a little more crunch I will add some seeds. As far as nut butters there are so many great options from raw almond butter or peanut butter to some of my fun favorites I like with this salad like Wild Friends Cranberry Sesame Peanut Butter, Peanut Butter & Co Cinnamon Raisin Peanut Butter, or some new favorites Kolat Superfood Fushions Vanilla Cherry and Cinnamon Blueberry Walnut! This is a salad kids love too and can easily be made for lunch boxes. 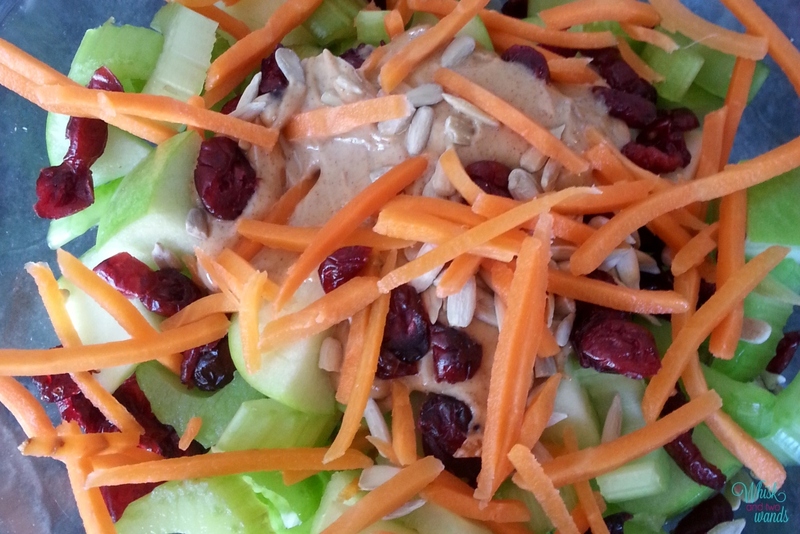 If you make this salad I would love to hear what you add to it and nut butter you use! Do you have a favorite nut butter to enjoy with apples? In a small bowl mix almond butter and almond milk until desired consistency to make an almond butter dressing. You may not use any almond milk, depending on my mood and almond butter used I use up to 1/4 of a cup. Toss together chopped celery, apple chunks, cranberries/raisins, and any other additions. Top with almond butter dressing. Enjoy! Thank you! It isn’t the prettiest but the flavor makes up for it!